Dog owners take note that your dogs pads are extremely sensitive and very susceptible to tearing and abrasions. We had issues with Rocky tearing his pads on hot asphalt a few years ago and over the long weekend little Apollo torn an entire toe pad right off on our chain link fence! A cut like this was much different than Rocky’s torn pads thoughts. It bled much worse and there was a lot of exposed meat. Like we did with Rocky we cleaned it and wrapped it up but unlike with Rocky, Apollo won’t sit still and he was hopping around the back yard on three legs and trying to get us to throw his ball mere hours after he hurt himself. 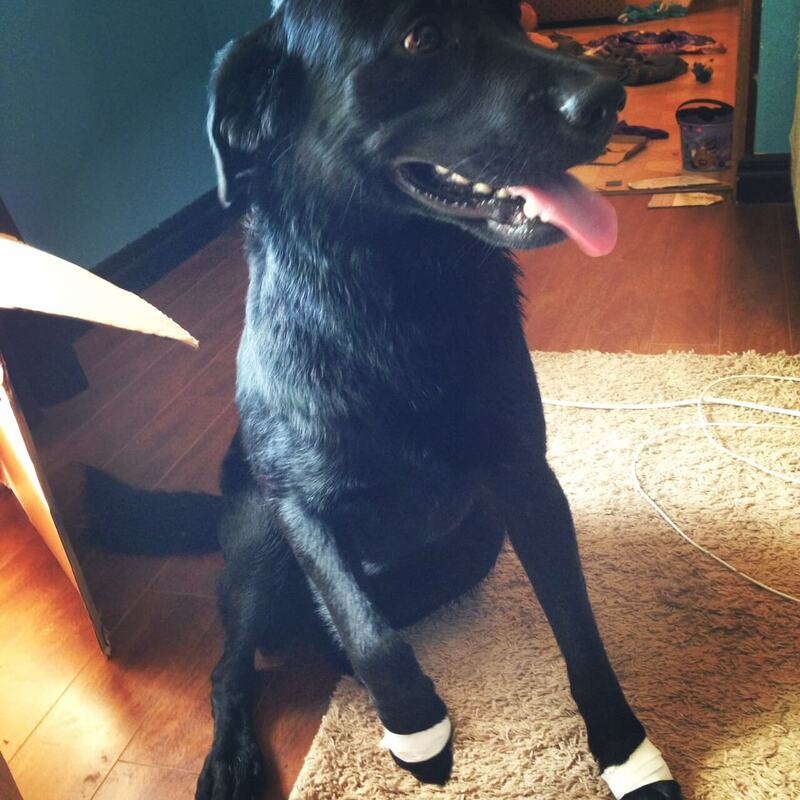 I went to town to buy more bandages and to look for a cone since he kept trying to lick his paws. Petsmart was all out of M, L, and XL cones and the worker said she had never seen that before. I told her it’s probably because it’s summer time so all the medium to large dogs are outside getting into trouble. But on Day 2 we went to clean his bandage and as we unrolled it a putrid stink like a dead animal came from the bandage and I freaked. I know that if a wound smells it’s infected and even though it was Sunday night we paid the big emergency fee and took him to the 24 hour pet hospital. I’m glad we did because he did have an infection and needed a two week course of antibiotics and we got him some painkillers too. He’s hopping around now on three legs and looking a little sad. I hate when babies or animals are sick or injured because you can’t explain to them that it’s only temporary. I figured I would share a few lessons learned from my experience on treating a torn pad and trying to avoid them in the future! Check pads often during the summer– Make a habit of checking out your dogs pads every few days to spot any minor injuries before they become big ones. How do you protect your dogs feet in the summer? Any other tips for treating a torn pad?